Dave and Anne Moulton lovingly craft small amounts of Pinot Noir and other varieties from their winery located high (1,600 feet) in the Santa Cruz Mountains adjacent to the historic Burrell School building which dates to 1854. An inviting tasting room is located in the original Burrell School Carriage House and overlooks the estate vineyards. It is in close proximity to the San Andreas Fault but Dave promises that the only earth quaking thing you will experience here are his wines. 14.4% alc., 336 cases. · Showy aromas of hi-tone black cherry and black raspberry fruit with plenty of smoky oak, a hint of barnyard and maybe even a touch of good Brett. Dusty fruit with a hint of spice and wood, but with a chemical note to the finish. Light, elegant and nicely balanced. 14.4% alc., 720 cases. · Starts off with alluring bright dark stone fruit aromas with a hint of mushroom. Very tasty and impressive black cherry and blackberry core with powdery tannins and a tangy finish. The silky texture is pure Pinot. Balance is spot on. This is a terrific wine which will only get better over the next couple of years. 14.5% alc., $35 · A blend of three top vineyards. Mahogany tinged color. Drinks like an aged Pinot Noir. Aromas of blackberry, raisin, allspice and leather. Tasty subtle darker fruits with spice and brown sugar. Soft, smooth, and light on its feet, the wine is showing nice mature features. 13.8% alc., $38. Ed Muns and Mary Lindsay farm this challenging site at 2,600 feet characterized by crumbling slate soil from a former sea bottom. · Complex aromatics featuring strawberry, raspberry, fresh hay, rhubarb, iodine and a touch of funk. Soft, light and gentle with a good acidic tang. Nothing really stands out on the palate, and there is a lack of punch, but the wine drinks fine. 15.3% alc., $36. · Very dark reddish-purple in color. Opulent aromas of dark berries and damp earth. A big mouthful of dark fruit framed by very strong tannins. Atypical for a Santa Cruz Mountains Pinot Noir, the wine is lacking acidity and brightness of fruit. 14.5% alc., $39. Primarily from fruit grown in Goldridge soils. New label. · Lovely scents of red fruits, vanilla, root beer and a subtle touch of alcohol. Wood-kissed, the wine offers racy red stone fruits, a little earthiness, a solid acid core, and fine-grain tannins which hold everything together. Fred Scherrer knows Pinot and his wines are as reliable as you can find. 14.4% alc., $27. Composed of favorite lots of winemaker Patrick Melley. · Brooding black cherry scent followed by interesting black cherry, raisin and nutmeg flavors highlighted with oak . Plenty of fruit intensity and a persistent finish. In essence, a reserve wine only in the sense that it is bigger and more intense than the next wine (described below) which I preferred. 14.6% alc., $37. The Tara Vineyard surrounds the Russian Hill winery and is named for the stately home that sits on the property. · Lovely strawberry and Bing cherry fruit aromas with a hint of cola, herbs and smoke. Very tasty black cherry and black raspberry core with notable char and grilled meat overtones. The fruit is bright and clean and is framed by gossamer tannins. A nice acid lift on the finish makes you reach for another sip. About all you can ask for in a California Pinot. Ryan Zepaltas is one of the new, young hounds making Pinot Noir in Sonoma’s Russian River Valley. The 28-year-old Zepaltas is the assistant winemaker for Adam Lee at Siduri, where together they craft artisan wines in a converted warehouse in Santa Rosa. Recently featured in Wines & Spirits (April, 2008), Zepaltas is a former skateboarder from Wisconsin who, not surprisingly, is a Green Bay Packer fan. His small production of 500 cases includes a Suacci Vineyard Sonoma Coast Pinot Noir ($49) and a La Cruz Vineyard Sonoma Coast Pinot Noir ($47) in addition to the wine reviewed below. He said in the article that “I’m an acid freak. I like things that are angular and hard to get at.” I think the wine reviewed below exemplifies this philosophy. 14.5% alc., $45. · Light red in color. Bright aromatics that change constantly in the glass and exhibit cherries, strawberries, smoke, oak, and herbs. Lighterweighted, the wine has lacy, delicate cherry and raspberry fruit with slippery tannins and bright acidity. An outstanding food wine and highly recommended for those who appreciate a restrained and “angular” Pinot Noir. Note: Last year I tasted two Pinot Noirs released by Zepaltas in the 2005 vintage and honestly I could not recommend either and did not feature them in the PinotFile. I was quite happy to see the improvement with this vintage with more emphasis on restraint and layering of flavors. The wines are distributed through retail channels as the website becomes developed. 15.1% alc., 400 cases, · Sweet dark berry fruit with a little bubble gum note. Heavy oak char from start to finish. Impressive essence of Bing cherry fruit, plenty of tannin and a short finish. Copious power and oak here without much finesse. The alcohol is well integrated. May benefit from more time in the bottle. 15.1% alc., 400 cases, · Similar to the Russian River Valley bottling, but more structure and density Aromas of oak char, barnyard and alcohol predominate. Chewy, dark fruits with earthy overtones. Dense in structure like a powerful Syrah. Generous drying tannins. 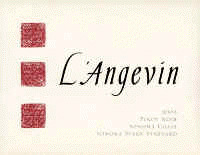 Note: I am a fan of L’Angevin Chardonnays, particularly the Ritchie Vineyard bottling. I had tried the initial L’Angevin Pinot Noir release a couple of years ago and was disappointed, so I revisited this vintage. The 2006 Pinot Noirs will have fans who like a big, extracted-style wine heavy on oak. I can appreciate the winemaking here as the wines have good balance and appealing smooth textures, but I personally can’t warm up to the overall style. 14.0% alc., 73 cases, $50. A limited release reserve wine sold by retailer, Bounty Hunter, in Napa. · The nose is rich with black cherry fruit. Lovely, hi-tone cherry and raspberry flavors accompanied by a meatiness and some sauvage with notable drying tannins. The berry fruit on the finish persists for many seconds. The mouth feel is silky. Classical Pommard in character, this wine was drinking beautifully the next day from a re-corked bottle. A keeper. 14.0% alc., $75. Cinghiale is Italian for wild bore. · Deep reddish-purple robe. Mysterious nose of dark stone fruits and sweet oak. Rich dark fruits on the palate which are very luscious but are currently overpowered by tannins. This is a big-boy Pinot that drinks like a Cabernet Franc. Packed and stacked, time is needed for the tannins to soften and the fruit to emerge. If you drink it now, decant and serve with a good steak. 14.5% alc., $30. “Named after the farm equipment workshop located next to vineyards in honor of hands on work of growing wine grapes and the people who do it.” Byron Kosuge is the former winemaker at Saintsbury and also consults for Kingston Family in Chile. · Complex scents of cherry pie, black raspberries, black current and a little barnyard. Red and blue fruits on the attack finishing with frisky acidity and moderate tannins. Not overblown with fruit and very drinkable. 13.5% alc., 662 cases, $36. A blend of 80% Iund Vineyard and 20% Sangiacomo Tailgrass Vineyard. · Dark strawberry red in color. A deep aromatic profile of black cherries and fresh sawn oak. The heart of the wine is cherries with an adept touch of oak and toast running through. Smooth, simple, and easy to drink. 14.2% alc. $35. This is not a misprint. Whitehall Lane has a stellar reputation for producing outstanding Cabernet Sauvignon from the Napa Valley. They began releasing a Carneros Pinot Noir with the 2005 vintage. · Toasted oak dominates the aromatics with a little funk and green notes. There is a solid core of red Pinot fruits with toasted oak in the background. The tannins are quite nimble and soft. The finish is a bit sour. The overriding theme of this wine is oak. 13.5% alc., $16. A reader has been a fan of this wine and asked me my opinion. Praxis Cellars, owned by Bill Arbios who also is the winemaker, produces multiple varieties from purchased fruit throughout California. The winery is based in Sebastopol, Sonoma County. This is the sixth vintage of Praxis Pinot Noir, the first variety bottled under the Praxis label.. · Appealing and alluring aromas of wild strawberries, crème de cassis, herbs and new mown hay. Decent core of redder fruits with some herbs in tow. A bit of citrus note on the finish which is clean and bright. An easy drinker and although the wine is often placed on the lower shelves of supermarkets, it is a respectable and user-friendly Pinot Noir ideal for everyday use. 13.6% alc. $27. I recently reviewed and thoroughly enjoyed the Bianchi Garey Vineyard Pinot Noir. This wine, however, is a horse (Pinot) of a different color. · The nose shows off beautiful crushed black raspberries, but alcohol spoils the experience. The wine is a bit tight and flat now and noticeably astringent on the back end. The dark fruits, such as black current, are appealing, and the tannin structure is admirable, but the wine is just not offering a lot of pleasure now. Maybe time will help some, but I fear the balance is off. 13.5% alc., $16. From Mayro- Murdick Wines. · Very light in color, close to some rosés. A light, simple wine featuring red fruits, particularly wild strawberries, and enhanced by fresh herb flavors. Basically a full-bodied Pinot Noir rosé. The wine is not as substantial as the 2005 version, but would be perfectly fine serve slightly chilled with grilled salmon. Costa de Oro Winery was founded by Gary Burk, a former musician whose father planted the 30-acre Costa de Oro Vineyard in the Santa Maria Valley. Gary was lured into winemaker after an epiphanic dinner with Jim Clendenen of Au Bon Climat and Dominique Lafon of Domaine des Comtes Lafon in Meursault, France. In 1994, he joined the harvest at Au Bon Climat and remained until 2002 when he left to run Costa de Oro full time. He began modestly in 1994 making small amounts of Pinot Noir and now crafts 4,5000 cases of wine at Central Coast Wine Services in Santa Maria. Noted Central Coast Pinot Noir winemaker Paul Lato is assisting. 14.5% alc., 2328 cases, $55. The 27-acre vineyard was planted in 2001 and is a partnership between Talley Vineyards, Kynsi, and Stephen Ross. · Dark violet in color. Capricious and juicy black cherry attack on the nose and in the mouth. Terrific grip and deft use of oak. An outstanding and harmonious wine in every way that needs some time to fully develop. 13.0% alc.. The label states that this is a Mediterranean interpretation of Pinot Noir. Imported by Steve Miles Selections Inc., Denver, CO. · The nose features barnyard, black fruits, char and some minerality. Grapey in flavor, there are some woodsy highlights, a citrus tang to the dry finish, and a mild harshness to the texture. Not anything resembling the North American Pinot Noirs that we have become accustomed. 13.5% alc.. Imported by Presser Wine Co, Richmond, CA. · Aromas of new-mown hay, farmyard and grass. Very light raspberry and strawberry flavors with an edible flower overtone. A bit woody, sour and tart with an astringent finish. An acquired taste! Hamilton Russell wines are among South Africa’s most prestigious. The winery is located in Hermanus, and is one of the most southerly in South Africa. It specializes in the cool-climate varieties, Chardonnay and Pinot Noir. In 2003, the Pinot Noir was awarded the trophy for the best Pinot Noir at the International Wine and Spirit Competition in London. Located on Walker Bay, the vineyards are in close proximity to the south Atlantic Ocean and are protected from the fierce summer winds by steep cliffs. The vineyards are planted on slopes heavy with stony, clay soils. Owner Hamilton Russell developed the site from scratch in the 1970s and has now turned the estate over to his son, Anthony, who works with winemaker Kevin Grant. The wines are estate grown and bottled. Imported by Vineyard Brands Inc., Birmingham, ALA.
13.5% alc.. · Menthol, marzipan, cedar and cassis compose the aromas. Redder fruits are featured, with a prominent woody and tobacco influence. The tannins are powdery and the wine holds admirable balance. 14.0% alc., $28. · Deep reddish-purple in color. The nose exhibits dark raspberry fruit, smoke, char and a hint of sulfur. Generous woody and green flavors accompany a core of dark and chewy soil-dusted Pinot fruits. Fine-grain tannins create a silky texture. A Nuits-St.-Georges-inspired wine with plenty of mother earth influence.